In the Belles Heures, the painter has presented the subject in two consecutive scenes. Enthroned in his palace King Herod, infuriated that the Magi have departed without giving him news of the Christ Child, hands to a kneeling soldier the order for a mass murder of all young boys born in the district of Bethlehem over the previous two years. A brutish-looking adviser stands beside the throne. The massacre takes place against a landscape dominated by the walled city of Jerusalem on the horizon. A stunned young mother in blue has had her child snatched by a soldier who dangles him by the legs. 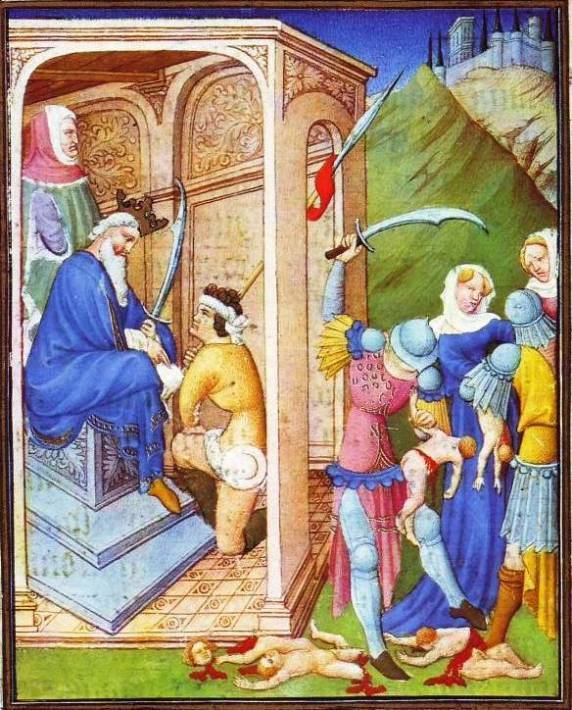 A guard raises his scimitar to dismember a baby suspended above his knee. Not surprisingly, therefore, holy relics of the infant martyrs were particularly numerous at the time this painting was made. Ogier d’Anglure, a contemporary pilgrim, was shown a great cofferful when he passed through Venice, so it cannot have been difficult for the Doge to provide the Duke with one entire little Innocent and a leg complete with foot. In addition his inventories list a pair of legs joined at the waist, which we see here among the dismembered limbs. Gruesome.